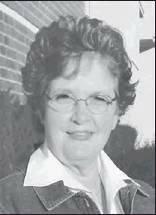 Donna Kaye (Potter) Gold, 72, resident of Henryetta, passed away Friday, Sept. 7, in Henryetta. Donna was born Feb. 8, 1946, to LaVerne William Potter Sr. and Ima Gene (Luker) Potter. Donna was born and raised in Henryetta and graduated from Henryetta High School in 1965. She married Glenn Gold in 1965 and together they had three children. Donna worked at Wal-Mart for 30 years and retired in 2010. Sunshine, rain or snow, she was there. She wore many hats during her time at Wal-Mart. From cashier, to baker, to receiving and answering phones, there wasn’t much she didn’t do. Donna made many life-long friends, co-workers and customers alike. She never knew a stranger. After her retirement, a typical Wal-Mart trip would be an all-day event. She just loved being around and with people. Donna found great joy in the simple things. She enjoyed reading a good book and going to church. She collected Denim Days Kids, sold AmWay, Tupperware and Home Interior, and loved all things cobalt blue. Donna’s biggest joy in life was spending time with her kids and grandkids. She was always game for a good tea party, building towers of blocks, playing in the ball-pit, or reading a bedtime story. Donna was a life-long member of the First Church of the Nazarene. Donna was preceded in death by her parents; stillborn twin sons; brother-in-law, Henry Bezinque; niece, Gina Potter; nephew, Shane Potter; and brother-in-law, James Gold Donna is survived by her son, Floyd Gold and wife Melanie of Henryetta; daughter, Delena Donathan and husband Jason of Checotah; son, Jason Gold and wife Loretta of Henryetta; grandchildren, Garrison Gold and wife Sarah of Stillwater, Quinton Gold and wife Katie of Glenpool, Ava Gold of Henryetta, John Michael Brickery of Norman, Marshal Brickery of Checotah, Sofia Brickery of Checotah, Ethan Gold of Henryetta, Mia Gold of Henryetta, Keaton Donathan of Checotah, and Katelyn Donathan of Checotah; sisters, Virginia Bezinque of Henryetta and Verna Goodner and husband Bill of Henryetta; brother, LaVerne Potter Jr. and wife Joy of Chandler and Jim potter and wife Beth of Henryetta; the father of her children, Glenn Gold; sister-in-law, Nancy Gold of Austin, Texas; as well as a host of other relatives and friends. Visitation was be from 12 p.m. – 8 p.m. Tuesday, Sept. 11, and will be from 8 a.m. – 8 p.m. Wednesday, Sept. 12, with family present to greet friends from 5 p.m. – 7 p.m. at Integrity Funeral Service. Funeral services will be at 2 p.m. Thursday, Sept. 13, at the First Church of the Nazarene in Henryetta with Rev. Tim Cole officiating. Interment will follow at Westlawn Cemetery under the direction of Integrity Funeral Service. A special thank you to Transitions Life Care: you are forever our family.